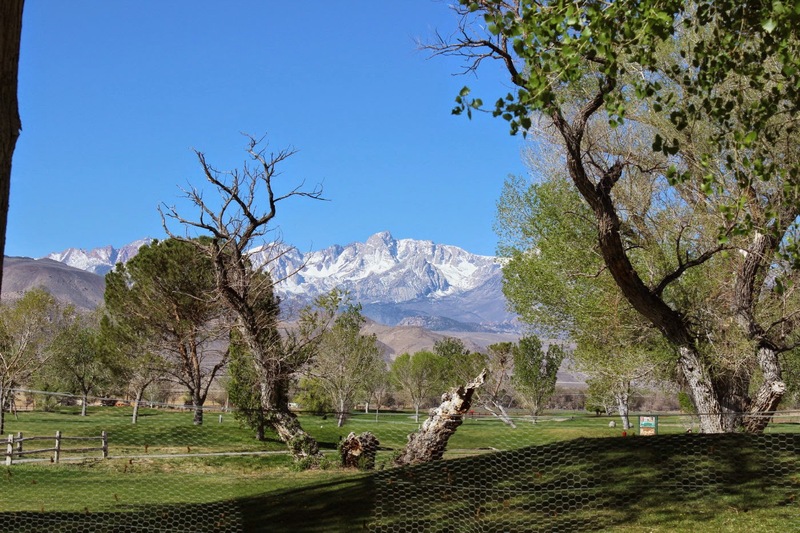 As much as Jan and I enjoyed Tuttle Creek Campground in Lone Pine, we had already stayed 12 days---very easy to do. 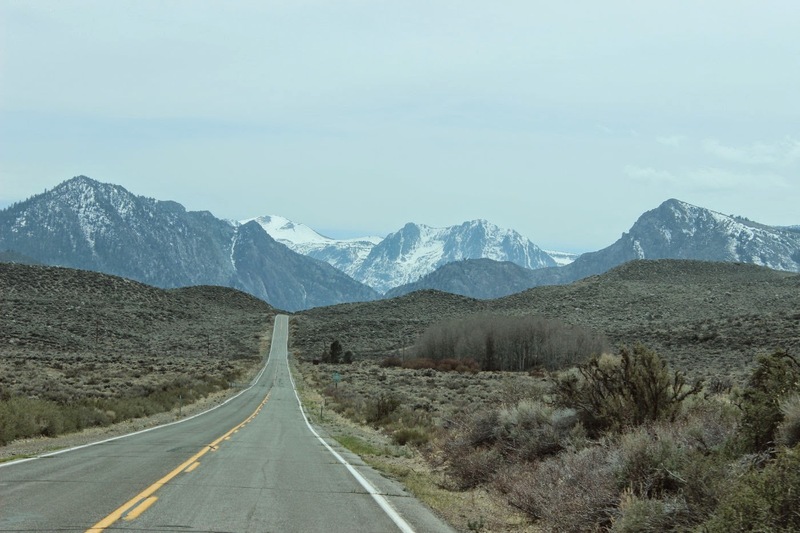 But, we had heard good things about traveling north on Route 395 with the Eastern Sierras on our left. 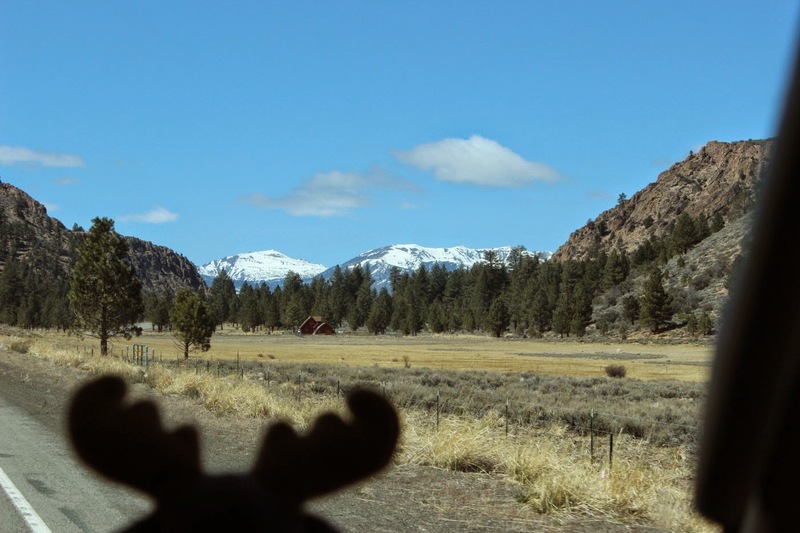 The first stop is at Bishop, California. Even though it is a small city of about 4,000, it is the largest and only city in the county. This view is from our campground, Brown's Town Campground. 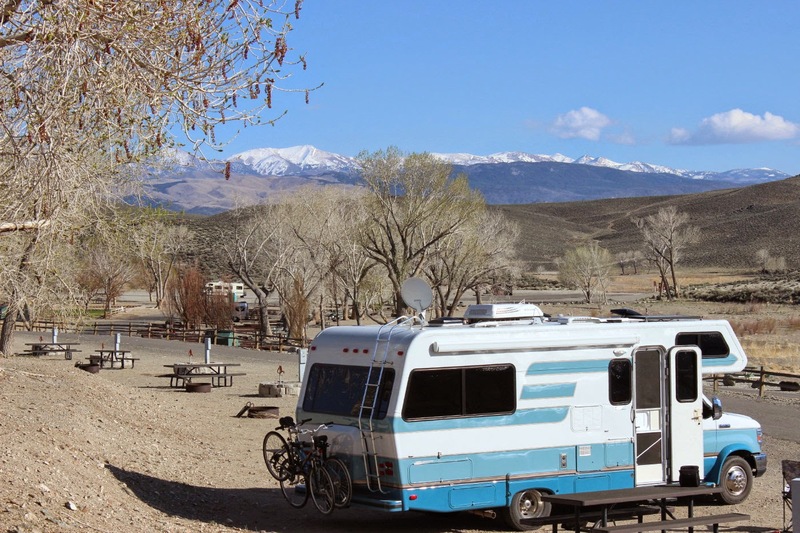 The campground is very comfortable, and the people are very helpful. Even though we had hoped to use National Forest Campgrounds (not open until at least end of April--some not until June. ), we are enjoying the private campgrounds--very nice people. 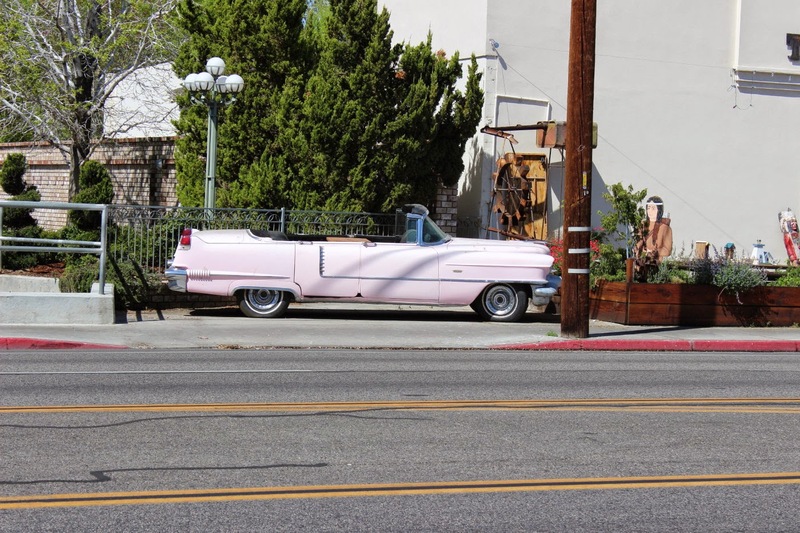 How about a pink 1956? Cadillac? 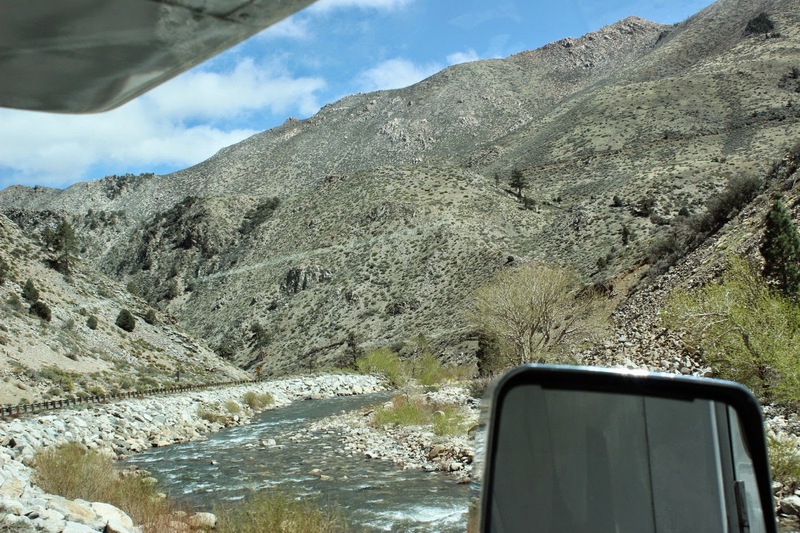 Bishop,California info It should take you to fishing info, but you can browse around. The "Activity" button will take you to a railroad museum and more. 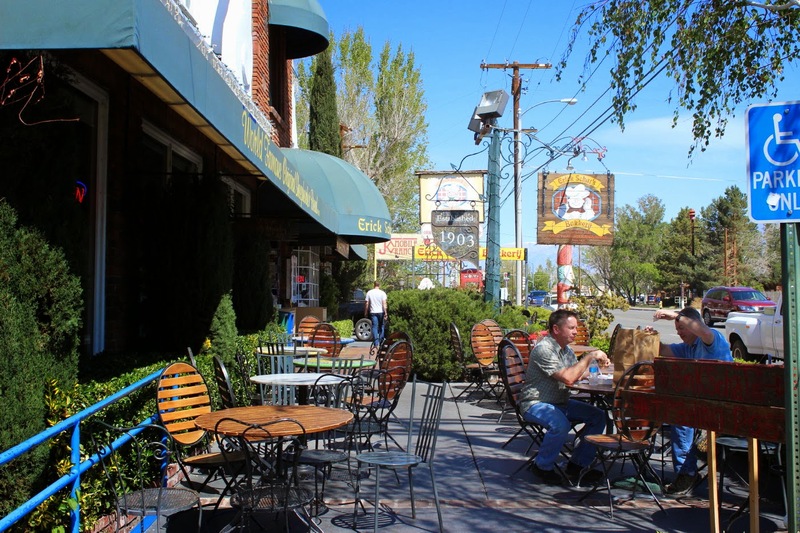 The most mentioned business in Bishop is the world famous Erick Schat's Bakkery. Yes, with two "k"s.
Inside are loads of fresh baked goodies. We had to try their famous Sheepherder Bread--wonderful!!! Also a Cherry Streudel. Delicious, with loads of cherry filling. A must stop if you travel this way. 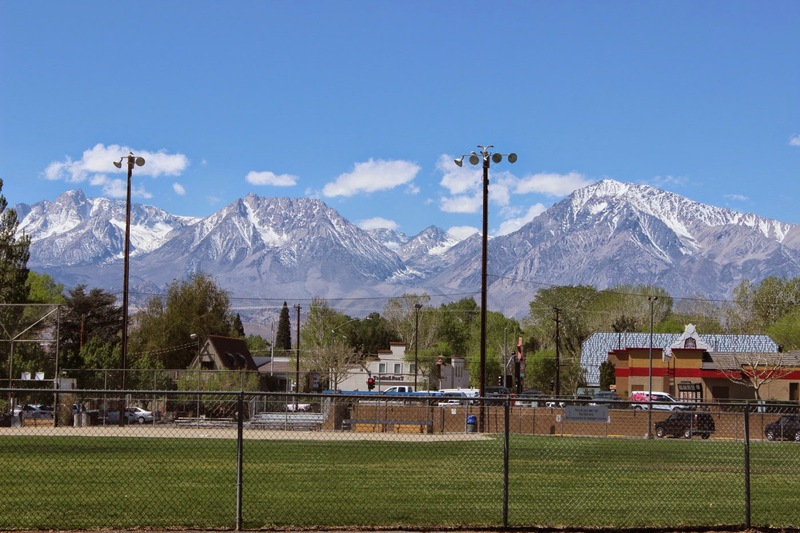 With the polite people, and wonderful food, and this view from the town parks in the center of town, it is hard to imagine why there are only 4,000 people listed as residents of Bishop. 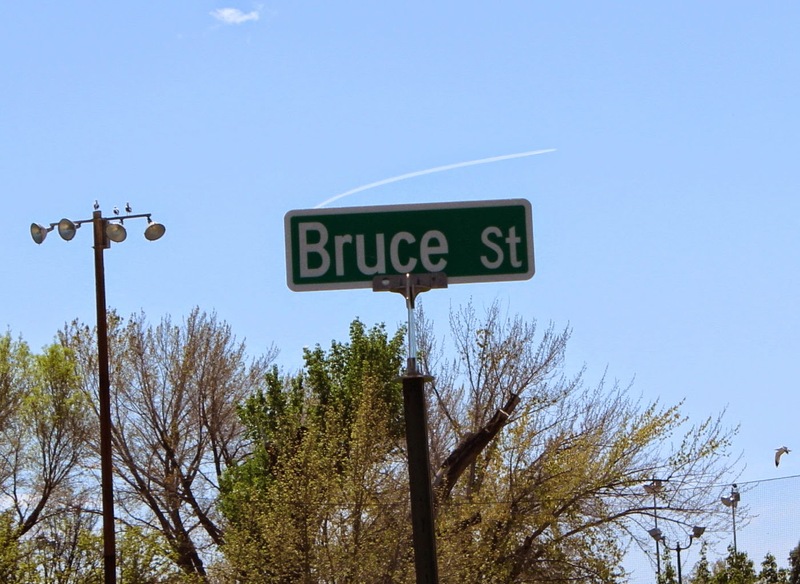 And , of course, any town with a Bruce Street, has to be wonderful! 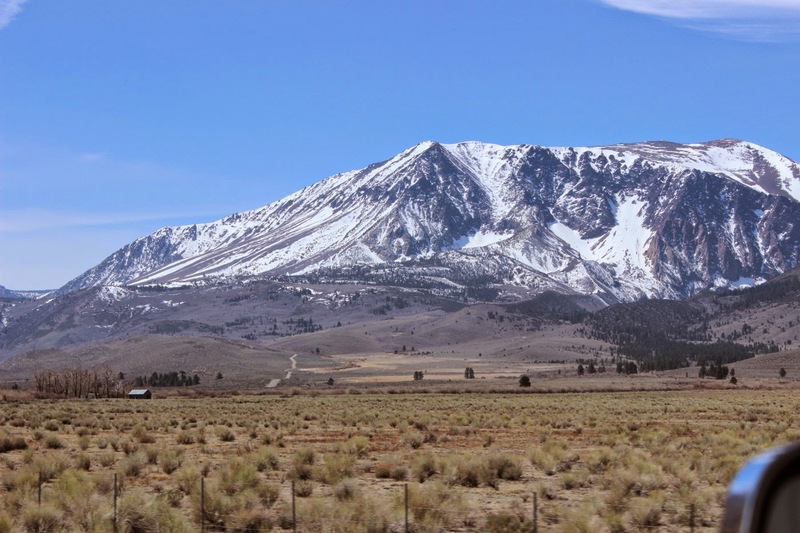 Traveling further north on Route 395 , the road goes around and sometimes over mountains. From a bit down the road, you can see that this house has a giant front yard and a whole mountain range in the backyard. No other homes around. Could you live here? 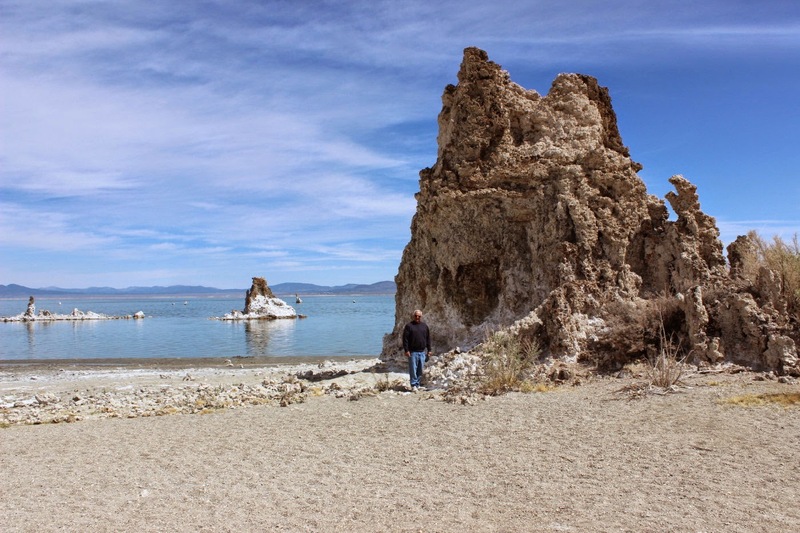 Our next stop is Lee Vining by Mono Lake. Lee Vining is a small town (about 4 blocks long) with connections to many other popular places. 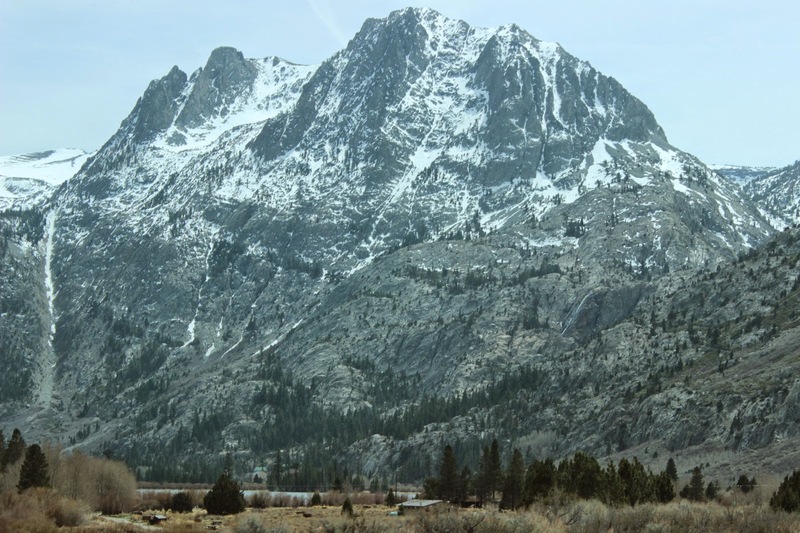 Tioga Pass road, Route 120, is just a few miles south. From here to Yosemite Village is listed at 77 miles. Of course, it is closed for winter until about mid May to early June. 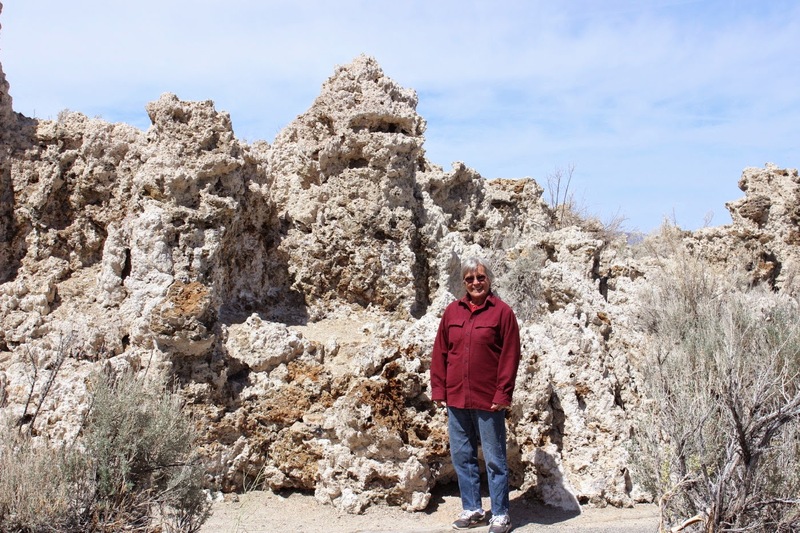 Jan is standing in front of Tufa formations at Mono Lake. And Bruce in front of another. Mono Lake does not drain to any streams. As a result it accumulates sodium chloride(salt), sodium bicarbonate(baking soda), and other minerals. It is 2.5 times as salty as the ocean and 100 times more alkaline. The result is that people can swim, but have a hard time getting below the surface. Canoes ride very high in the water and ducks have a hard time getting their feet low enough to paddle. This used to be a health resort many years ago. Now it is used for swimming and is a major stopover on the Pacific Flyway. Over 98 species of birds will stop here. The lake will not support fish(too salty), but it does support trillions of brine shrimp. Starting in the Spring, a few weeks from now, when the shrimp begin to hatch and grow, millions of birds will begin to stop by. Yes, that was millions. Some are on their way as far as Argentina. 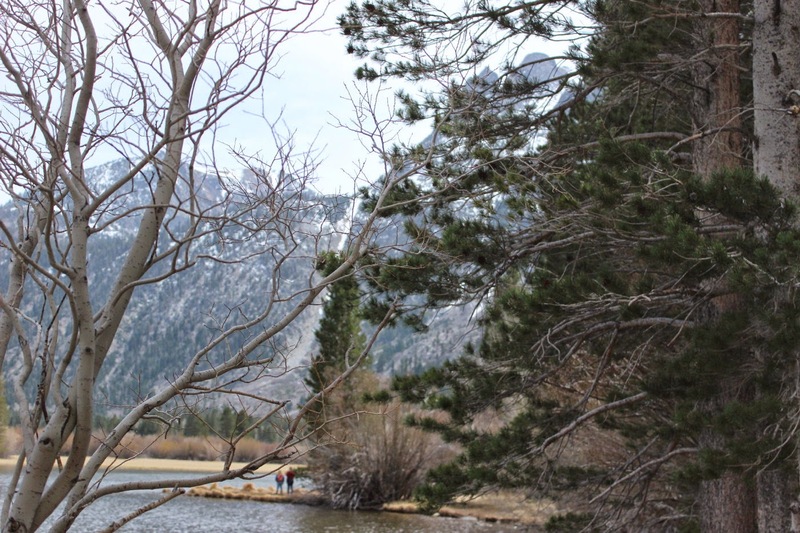 In 1941, this lake was tapped by Los Angeles for a water supply. The lake dropped drastically and the birds and shrimp were affected. But , in 1994 state leaders were convinced of the importance of this food chain link and reversed the drainage by limiting the drainoff. The lake is slowly recovering to its original levels. Those tufas from above pictures are formed by underwater springs almost like caves form stalagmites and stalactites. 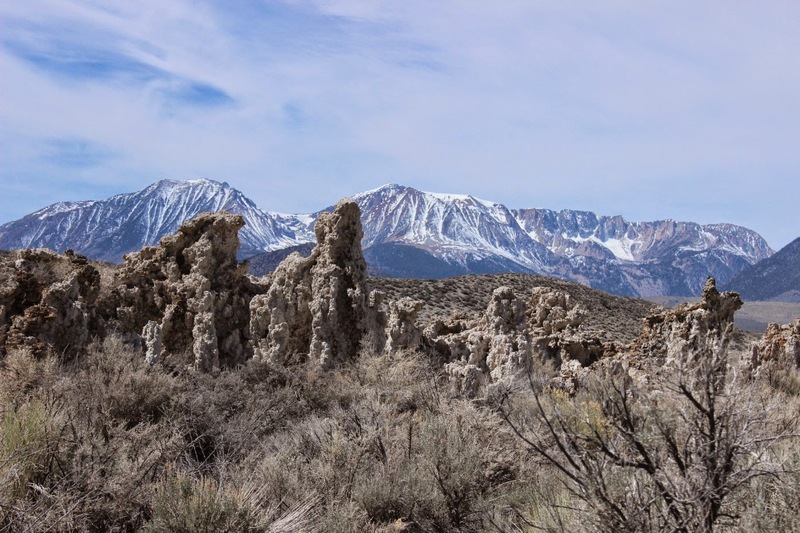 Across Route 395 from Mono Lake is the June Lake Loop. This is a scenic road around about four lakes that goes close to some mountains as well. Not too long ago there were ski areas here. Now there is not enough snow. 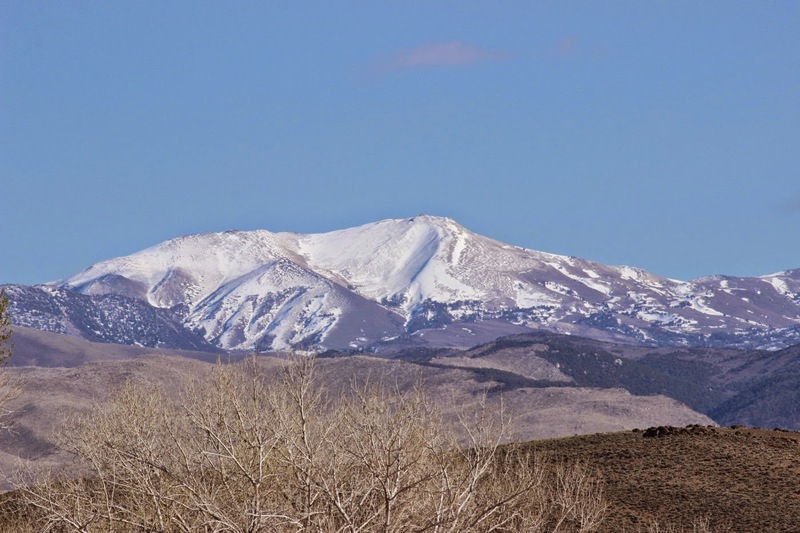 Even though these mountains are 13,000 feet and under, they are still very impressive because they rise directly from the 7,000 foot base. 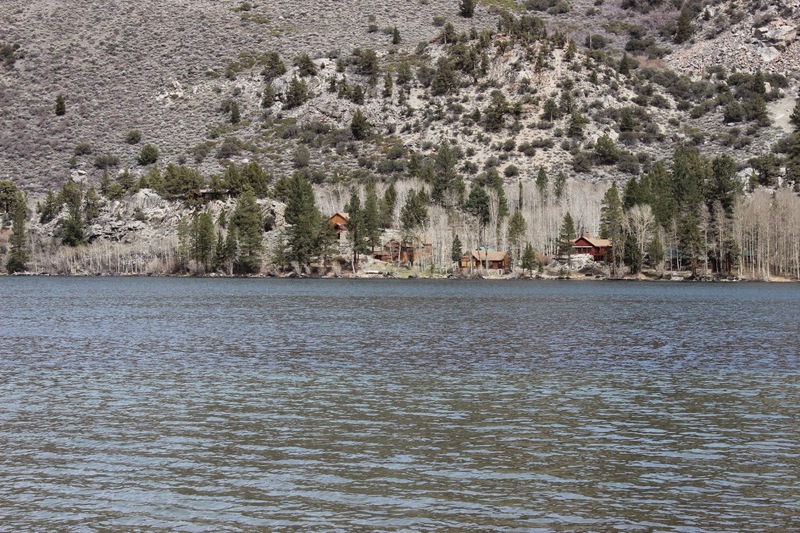 With a view to some of those mountains and clustered around the shore of June Lake, these are some impressive homes. The local info indicates that early movie stars such as Clark Gable, Betty Grable, and Charlie Chaplin stayed here at June Lake Lodge. There are some National Forest campgrounds here that would have been great, but not open until weeks later. 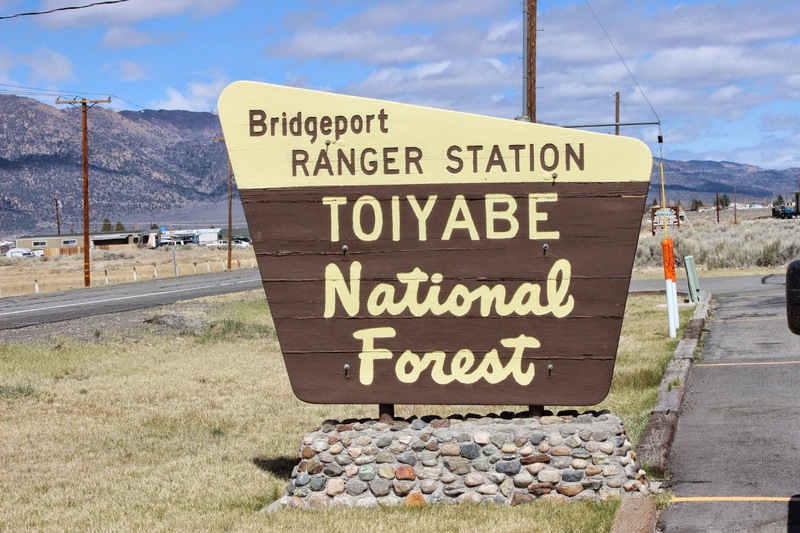 Bridgeport is another town on Route 395 with large farms on flat valley land. Oh, and also fantastic views of the Sierras. We had a great conversation with two rangers about routes north and possible routes into Idaho from Oregon and out to Wyoming. It seems the opening of some campgrounds is linked to the opening of fishing season. North of Bridgeport, another large home with large greenhouse. A very interesting area. In the foreground are sage and other high desert plants. Where streams and springs come from the mountains, there can be pine forests and other trees. Just 30 to 50 miles west into northern Yosemite, there is a lush forest from the rains squeezed out of the clouds before they can cross the Sierras. But, the streams on the eastern side can be quite full from runoff. And the fishing is supposed to be spectacular. Note here the sparse desert vegetation on the hillsides. And here we are at Topaz Lake State Park. Or county park depending on your information. This is in Nevada which is a strange little diversion from California on Route 395. Lake Tahoe is just a bit north and half is in Nevada and half in California. We are staying here and perhaps heading up to historic Virginia City which is a little north of Carson City and southeast of Reno. We are also looking at weather forecasts that are calling for 3 to 5 inches of snow around Tahoe and some local higher elevations in the next few days. Meanwhile , this is very comfortable.